It’s a very cold day down here in Texas. Although we don’t have any snow, it is the perfect kind of day to get out a good snowman game. Today, I have a snowman roll and cover number game for you. The free snowman printable is a fun Christmas game or winter themed game for kids. The game is listed as a freebie in my TPT store. The first thing that you will need to do is go there to download your Snowman Game. Then, print off the pages that you wish to use. While you are there, be sure to follow my store so that you can be the first to know when I post new resources and fun freebies. The set includes 4 different game boards so that you can challenge kids at different levels of learning. I have also included some printable snowflake circles. The circles can be used to cover the squares on the game board but little erasers, small snowflake ornaments, buttons, cotton balls, etc can be used in their place. You will need a standard 1-6 die to play. For those kiddos who have not yet mastered numerals, there is a dot pattern version. Kids take turns rolling the die and covering the matching dot pattern on the game board. The first child to cover 4 squares in a row is the winner. There is also a version with the numerals…and kids can play in the same manner. If kids are up for a challenge, you can use the one more and one less game boards. To play with the one more game board kids will roll the die, add 1 to the number on the die and cover the corresponding number on the game board. So, if a child rolls a 4 he or she would cover the 5 on the game board because 4 +1 = 5. To play with the one less game board, kids would subtract 1 from the number rolled and cover the resulting number. So, if a child rolls 4 he or she would cover the 3 on the game board. I hope that you enjoy playing this little snowman game with your kiddos. 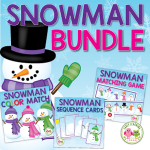 If you are interested in more snowman and winter activities, please see the following resources in my store. You take turns rolling…..and only cover a number on your turn. You roll and cover your number, then she rolls and she covers her number, etc. If they can’t be edited… then how does anyone win? Surely I’m missing something. I want to play with my daughter but we would have the same board… so everything that is rolled she and I both get the exact same space so we would both win at the exact same time. What am I missing? I had the same trouble downloading the file, so I tried your direct link and it keeps saying it’s “Failed to Load PDF Document”. Do you happen to have it on your TPT site? trying to load, it indicates network error both with the downloading option and with the link that was attached above too. I can’t seem to download the snowman any ideas where I am going wrong ? It says Network error. No, these cannot be edited. Thanks for the idea….perhaps I will do editable roll and cover activities in the future. Can these be edited to change those numbers for bigger numbers?